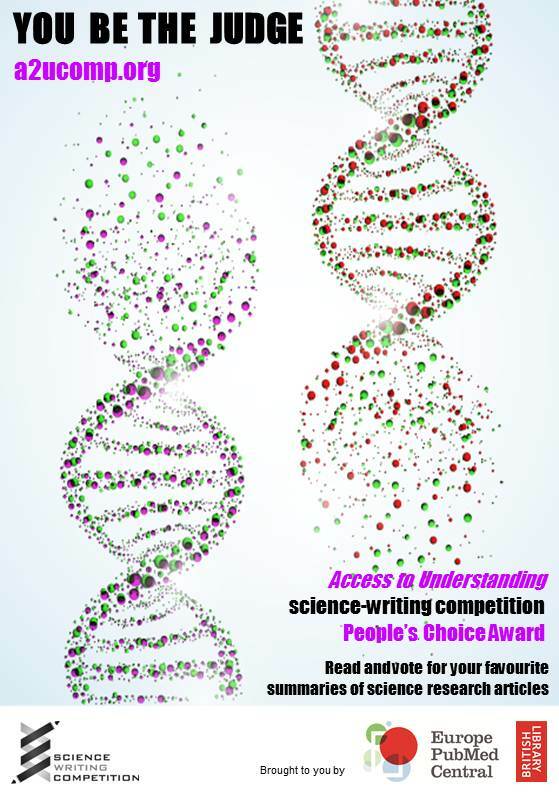 Access to Understanding science-writing competition People’s Choice award. Access to Understanding seeks to make the science presented in jargon-heavy research articles accessible to a wider audience. Competition entrants were asked to write plain English summaries of scientific research articles for a public audience. Each summary needed to explain why the research was done, what was done and why it was important. Entrants could write about one of 10 articles, each covering fascinating cutting-edge science including combining drug therapies to treat cancer, brain scanning to better understand specific function, a new way to assess effectiveness of arthritis treatments, and an analysis of malaria resistance around the world. The 10 best summaries have already been selected by our judges, and assessed for their scientific accuracy. Now we want to know what the public make of them. Are they interesting? Are they easy to understand? The People’s Choice award is a really important new development for the Access to Understanding competition. We value this opportunity to find out what people think of the summaries and how successfully the science has been communicated. Struggling to make sense of current scientific findings? Frustrated with the jargon and information overload that accompanies science research? The Access to Understanding science-writing competition challenges entrants to write plain English summaries of fascinating, current research articles (all available from Europe PubMed Central). This year, in addition to the judges’ choice, you have the opportunity to tell us what you like! The People’s Choice award aims to give a voice to those for whom the summaries have been written and allows us to reward the best. The competition will remain open until 12.00 on 24 March 2014, and the winner will be announced that evening at the awards ceremony. You can vote for as many articles as you like, once a day. We encourage you to share any and all comments at any time. Don’t forget to tell your family, friends and colleagues. These fascinating pieces will be of interest to all! 5. Europe PubMed Central (Europe PMC) is a free-to-access online resource for biomedical and health research information. It is funded by 24 funders of research from across Europe, led by the Wellcome Trust. Each of the original articles included in the competition is freely available from Europe PMC. 6. The science team at The British Library supports the information and data needs of research through an innovative programme of services, projects, events and other activities. 7. The Access to Understanding award ceremony forms part of Beautiful Science season at The British Library, which comprises an exhibition (Beautiful Science: Picturing Data, Inspiring Insight) and range of fascinating science-based events. This entry was posted on February 28, 2014 at 11:30 am and is filed under Uncategorized. You can follow any responses to this entry through the RSS 2.0 feed. You can leave a response, or trackback from your own site.